Authored by piggz on Apr 13 2017, 10:07 PM. Test 1. Try to insert all report elements. 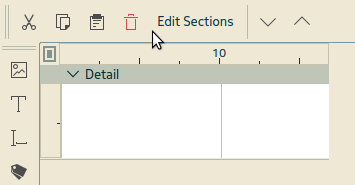 Open existing reports in Kexi. Preview them. Expected: correct positions of elements in design view and preview. Test 2. Change page units to all other units. Expected: correct property values and positions of elements in design view and preview -- values and suffixes (units) follow changes and effective positions/sizes are not not affected by current unit settings. Similarly, margin values update properly, custom page width/height update correctly (even if non-custom page size is in use). Test 3. Change page size to custom, change page units to all other units. Expected Design view and preview should show correct size, report elements stay at their positions and have constant sizes regardless of the unit picked. There are 2 TODOs (see the description) before pushing it. piggz edited reviewers, added: staniek; removed: piggz. 1st step done: reviewed the rebase https://phabricator.kde.org/D5441?vs=13438&id=19211. Good job! Thanks Adam, that's gigantic step forward, we're almost there. Please see the updated 3 tests on the top so we look at the same aspects. Step 1. 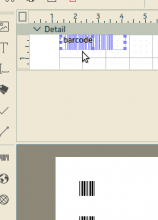 Select report, ensure mm is the Page unit and Detail section's height is 20mm. Extra info #1: Possible regression, no such defect in kreportexample 3.0.2. Issue 3.1. Not OK: Change units afterwards: like in Issue 2.1, elements disappear in design view e.g. after changing unit from mm to inches but stay OK in preview. Preview can disappear entirely sometimes too. Changing back to mm restores the state and all is allright. Great, I understand it's not yet pushed. Added new issue 2.4. Maybe it's fixed in the meantime by you but maybe not. Thanks, marked Issue 2.1 as resolved. All OK @piggz! Works so well now. 4.1. 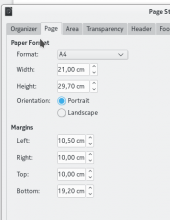 Change page size to custom. Issue: designer's Detail area is not fully repainted. Only changing height of the detail section repaints it eventually. grid for pica and cicero is 10, that's big, shall be 5? grid for points is 100, shall be 50? 5.1. Scroll over the Right margin value to increase it. 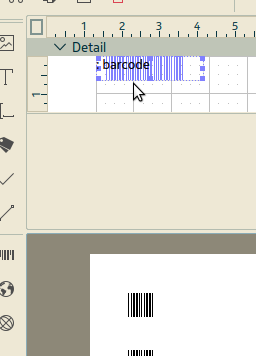 Issue: the added value adds offset to the the grid. Expected: no such thing, grid should stay as margin is nonvisual in the designer area. The same happens when Left margin is changed this way. 5.3.5. Page size was changed so the printable area has negative width. Solution: fixup the left and right equally by adding (page.width-left-right)*0.75 to them. Example: Page width was 210mm with left margin 60mm and right margin 70mm. Page width changes to 110mm. Left margins are fixup by page.width-left-right)*0.75==(110-60-70)0.75==-20*0.75=-15mm. Now left margin is 45mm and right is 55mm. Page.width is thus 10mm. 5.3.6. 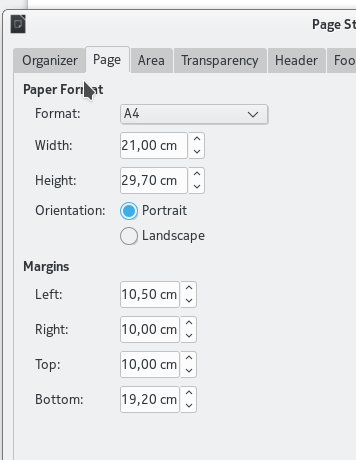 Page size was changed so the printable area has negative height. Solution: fixup the top and bottom equally by adding (page.height-top-bottom)*0.75 to them. Note for 5.3. *: Any fixups should use setValue(..., KProperty::ValueOption::IgnoreOld) so there is no step in undo buffer. For negative values we're loosing the grid. For 0 there's section height set to NaN and and it visually disappears. In this case the grid visually disappears, not sure why. For unit=dm even 100 is OK. We need some display fix or setting some maximum. 7.3. Set unit=dm, set Grid Divisions to 40, then mouse-wheel up to increase Grid Divisions. Expected: Grid Divisions increases and Grid Divisions editor still has focus. Actual issue: proeprty set is changed to Details section and we're thus loosing the Grid Divisions context. Note, I cannot reproduce 7.3. Scrolling mouse over grididivsions works as expected. This appears to be in kproperty ... the same happens in KPropertyExample, with the 'billions' property, which has a suffix. Doesnt happen in 'Dollars' property which only has a prefix. 4.1, 5.1 fixed, good work. Added 5.2 and 5.3. Fixed in units makes 4.2 fixed! What do you think is a sensible max for margins? a % of the width/height? or some complex calculation involving calculating the size of the page and opposite margin? Maybe we can have the same. In MS Word 2016 for a Letter format I was able to have printable area == 0.1" even. On error all MS Word does it raising error with no correction. could you confirm if 5.3.1 -> 5.3.4 are possible? I've rebased master changes into this code: if you have unpublished fixes please do the same. Since kproperty 3.0.91 we're no longer using this complex math but instead: setValue(..., KProperty::ValueOption::IgnoreOld). This is effectively a fix but usability of this a bit low: user needs to locate the longer margin first and reduce it, then increase the desired margin (left-right, top-bottom). It is a bit frustrating when "keyboard does not work" because of the the max limits. How about setting max for left/right margins to page.width-smallest_page_size and max of top/bottom margins to page.height-smallest_page_size (e.g. for portrait A4: 205 and 205)? Then proceed with fixups from 5.3.[1-4]. For this solution we will need a KProperty parameter in this method so we know what property was changed and what property should be fixed. Please look that we never fix up value of property that is currently changed by the user, rather the other property. Do we need this specialized function in the public API? You are happy with 5.x? Maybe 5.x can be improved later.